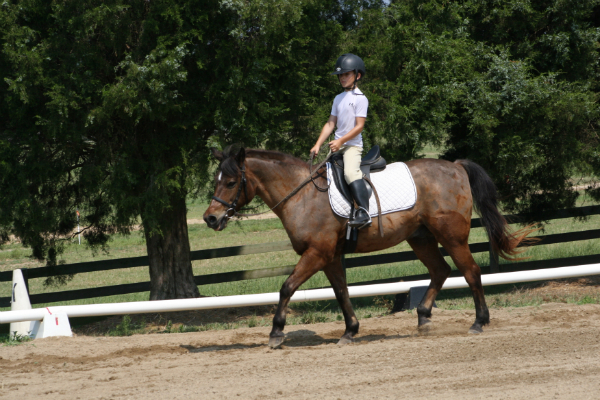 Fellowship Farm offers riding lessons for children and adults. We enjoy providing instruction to all levels of riders whether it is your first time on a horse or you are riding the Grand Prix. Instruction is offered Monday – Saturday in the form of group, semi-private, or private lessons. We offer a semester package for children’s group lessons. All other lessons may be scheduled by contacting your instructor through phone or email. If you are a first time student, we encourage you to set up an appointment to visit the farm, watch a lesson, and meet some of our fantastic equine instructors! To schedule a visit or set up your first lesson please call 336-697-0605 or contact any of our instructors. We hope your aspiring young equestrian will join us for 14 weeks of learning to groom, tack, ride and properly care for a horse. Lessons will be offered on Wednesdays (4:00pm-5:30pm) and Saturdays (10:30am -12:00pm) *time subject to slight change) starting the week of August 31 and concluding the week of December 17. More lesson days may be added pending interest. Semester rate for 1 lesson per week $630, pay per lesson $50. We ask that you commit to a specific day and time. 24 hour cancellation notice is required. Makeup lessons for students paying semester rate will be scheduled on a first come first served basis within 1 WEEK of cancelled lesson. It is the responsibility of the student to contact their instructor for a make-up lesson. *There will be no lessons the weeks of September 14 or November 23. Contact Katelyn Young for more info or to sign up at katelynyoung@fellowshipfarm.net or 336-337-9577.